It’s no secret that the general public has grown tired of the typical guitar-driven rhythm games as Guitar Hero has dissolved and Rock Band has no plans to release a new game. The market for those games has continued to decline since 2008, as gamers began to tire out on the same repetitive system. 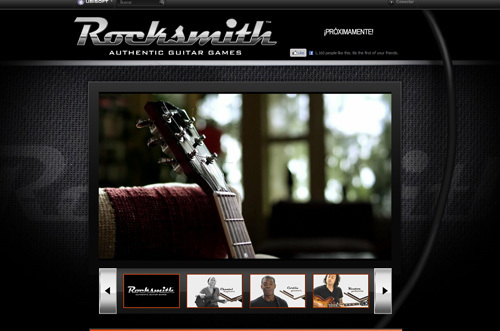 In order to give the music video game genre a boost, Ubisoft released Rocksmith, a guitar-driven rhythm game in which the player uses a real guitar with a ¼ inch jack and a USB cable connecting the guitar to the console. What makes Rocksmith different from Guitar Hero or Rock Band is that the game runs on dynamic difficulty curve in which the game sets the difficulty based on how well you’re playing. If you’re an experienced guitarist then the game will become increasingly difficult but if you’re a beginner then the game will wait for you to improve before the difficulty increases. The difficulty will have players progress from single string notes to hammer-ons, pull-offs, chords, bends, and barre chords. This way the game cannot only help players improve their skills but also help beginners learn how to play the guitar. The game’s journey mode features a variety of unlockables including new amps, guitars, and tones for the player to use in the games built in amp mode. There are also technique challenges in which the gamer gets to improve certain skills through a practice mode designed specifically for certain guitar skills. The technique challenges are designed to help the guitarist improve specific elements of guitar technique such as hammer-ons or guitar chords. You can also unlock bonus songs if you are able to perform a double encore achieved in the journey mode. The dynamic difficulty setting does come with one flaw as you’re unable to set your difficulty. If you’re doing well in the game then Rocksmith will set the difficulty at the highest point you reached which can cause new songs to become trying. If you finish a song at one point and go back to play it again the song could be much harder than before causing the player to struggle with it. Luckily the game has a riff repeater so that you can master certain parts of the song in the event you struggle with the chorus or solo. To give the game an arcade feel, Rocksmith comes complete with a Guitarcade. The guitarcade is a collection of mini-games that aim to help teach and improve some basics such as scales or chords. The games are made to look like older generation games such as Space Invaders, Tetris, and Duck Hunt. The guitarcade is very enjoyable and a valuable resource for players looking to improve their overall playing ability. One of Rocksmith’s missing elements is how the cooperative mode seems bland and leaves the player feeling alone. You can only play co-op if on the same system and the only objective is to score more points than the other player. So far the game does not support online co-op mode. However there is an online store for players to purchase additional songs, tones and other guitar features. Another cause for concern is that the game will not do much for advanced guitarist looking to improve their skills as much of the game is meant for beginners to immediate players. They may find the game not challenging enough for them to enjoy. The game’s amp mode allows the player to create their own customized tone and use it when they are playing the songs. Unfortunately, the game does not allow the player to record his own riffs to listen to or play again. This is another feature that separates Rocksmith from the rest of the guitar-driven rhythm games. The player has more control in how his guitar sounds and the ability to tweak that sound. Rocksmith will prove extremely beneficial for people who lack the drive to learn or improve their guitar skill as the game will give those lessons and tips that they might not learn on their own. Ubisoft has certainly taken the music game genre in a new direction and deviated from the boring repetitive way their predecessors have gone. If they can incorporate a better multiplayer engine as well as a way to tweak the difficulty level, then the music game genre might return to the success it experienced with Guitar Hero and Rock Band.